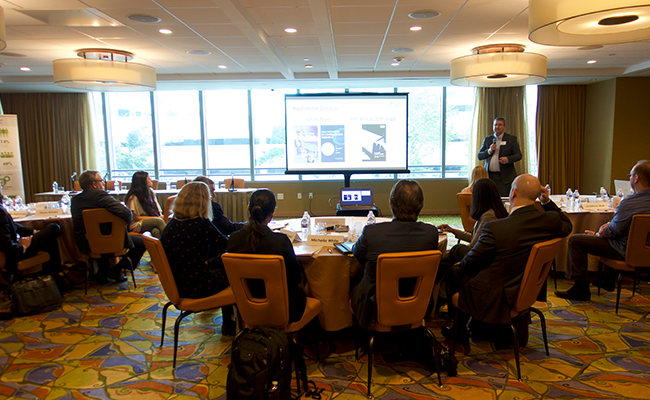 Amyloidosis experts from academia, industry and the FDA met last week for the Amyloidosis Research Consortium Inaugural Research Strategy Roundtable in Miami. The meeting, which brought together representatives from across the research continuum for the first time, was designed to breakdown the typical siloed mentality found in research. This format ensures that together, we invest our combined scarce resources to have the greatest impact for patients. The purpose of the meeting was to co-create a blueprint for amyloidosis research, mapping out the changes needed to accelerate and focus on the research most likely to make a significant and material contribution to improving patient outcomes. Over the two-day meeting, discussions addressed the challenges faced in each of the areas of bench to bedside research in amyloidosis. Panel topics included; research priorities, barriers to diagnosis, evidence development, clinical trial development and market access and health systems optimization. Key areas for each topic were prioritized and actions proposed, including the need to develop strategies for identifying better biomarkers and a commitment to sharing resources. These priorities will be written and published this summer as a white paper, creating a template for the amyloidosis research community. “It was inspiring to see the energy generated from the discussions and synergies created. This can have a significant impact on the research landscape for amyloidosis. Importantly for ARC, the identified priorities will shape our research strategy, particularly with regards to the clinical trials being conducted within our collaborative network,” said Isabelle Lousada, ARC CEO.